Hi there! 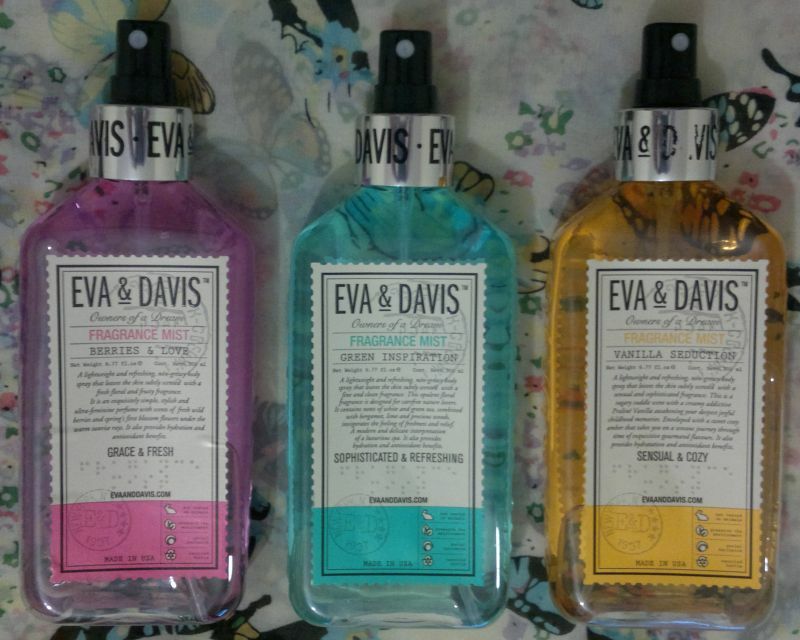 Today’s post is about 3 fragrance mists I picked up from TK Maxx – Eva & Davis Berries & Love, Green Inspiration and Vanilla Seduction. These fragrance mists are described as lightweight, refreshing and non-greasy, and they promise hydration and antioxidant benefits. Let’s start with my favourite! Berries & Love with wild berries and spring flowers smells amazing. It smells like a chilled red fruit jelly (raspberries, redcurrant, pomegranate…) without added sugar. It’s delicious! Green Inspiration – with notes of green and white tea, bergamot, lime and precious woods – is really nice too. The white tea note is very strong but that’s fine because it’s so nice! By the way, this fragrance mist would be suitable for men too! Eva & Davis Vanilla Seduction isn’t very enjoyable. It smells cheap. The vanilla and amber mix is too sweet and quite artificial. However, I think that people who love very sweet fragrances would like or love this fragrance. I think 2 of these 3 fragrance mists are very good – definitely better than certain designer fragrances that you can find in department stores, and they’re much cheaper! I paid £4.99 per fragrance mist (TK Maxx). I tried to find out more about the brand Eva & Davis, but their social media accounts and their web site have been abandoned, and there are no links to any stores that might sell their products. So I think it’s safe to assume they’re no longer in business which is a shame because I would have been happy to buy Berries & Love and Green Inspiration again!